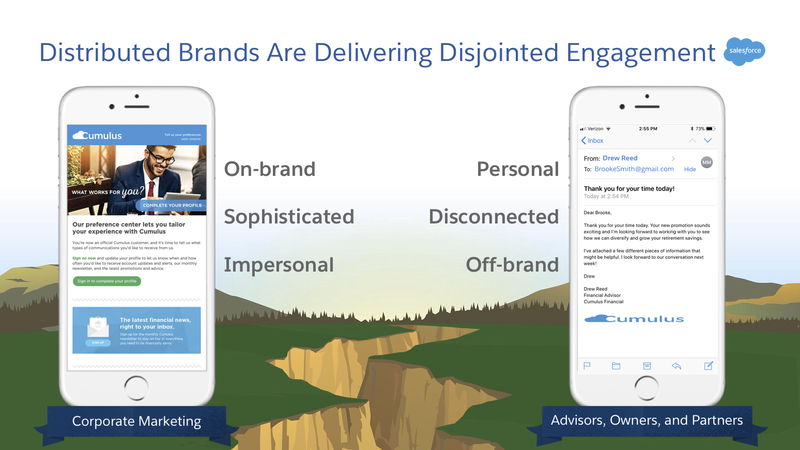 Identify how brands are delivering disjointed engagement. Identify the gap between marketers and nonmarketers. Identify use cases by vertical. More than ever, consumers expect seamless engagement from companies that is on-brand and personalized throughout their entire experience. That’s why 67 percent of marketing leaders say creating those connected customer journeys is critical to their success. However for distributed organizations, delivering connected consumer experiences is challenging. If you’ve ever walked into your favorite familiar fast-food joint or retail store only to find a new menu, unfamiliar products, or steeper prices, you know how jarring and off-putting that kind of experience is. The same goes for digital communications. Disjointed customer experiences can cause consumers to question a brand’s legitimacy, trustworthiness, and professionalism. Here’s one example that demonstrates how things can go awry. It’s January 1, the beginning of a new year, a new you. You head into a local gym to sign up for a new gym membership, and they offer 50 percent off your first month. A couple days later, you get an email from the company offering 50 percent off your first 3 months. When you go back into the gym the next day, you show them the better offer, and they reluctantly honor the better offer you received from their corporate team. That is not the experience your customers are expecting from any brand. You expect to get a seamless experience from the brand, no matter who you’re interacting with. Corporate marketing teams are laser-focused on delivering exceptional customer experiences. They know these initiatives are vital to differentiating their brand and leading in the market. However, corporate marketing can’t do it alone. In distributed organizations—like financial services, direct selling, franchisees, and channel sales—there are many people who interact with customers and help shape the overall experience. On the one side, you have the corporate marketing team that is in charge of delivering on-brand marketing campaigns—this team has the tools and budget they need to create sophisticated customer journeys. However, it often fails at scaling to the “last mile” of personal engagement that only nonmarketers can deliver on because they are the ones directly managing the consumer relationship. On the other side of the chasm, are your nonmarketers: agents, advisors, auto dealers, franchise owners, and so on. They own the direct relationship with the consumer, but they often struggle to access and create corporate-approved marketing materials. They just don’t have the marketing expertise, tools, or resources they need, specifically when it comes to digital. What they do have is the direct, authentic relationship and contact with the end customer. This gap between marketing and nonmarketers leads to disconnected experiences, and consumers feel as though two different companies are engaging with them—just like the gym example we talked about. How many times have you seen an email sent with the wrong logo or a pixelated image? You know right away that wasn’t sent or approved by your marketing team. 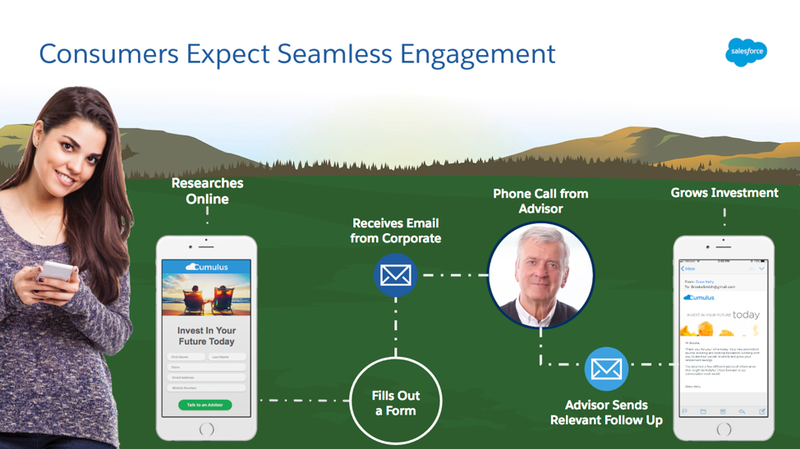 Distributed Marketing from Salesforce empowers nonmarketers with more information and easy-to-use tools as early in the customer journey as possible, rather than fully relying on them for the last-mile conversion. Corporate marketers are often the stewards of customer experience, but what if most of your customer touchpoints are outside of the corporate marketing department? Local marketers, franchise owners, partners, financial advisors, agents, and dealers all need content, resources, and easy-to-use tools to deliver seamless, on-brand customer experiences. To illustrate how distributed marketing works, take a look at how a prospective customer who’s in the market for an IRA engages with a financial services company and one of its agents. Brooke, a young professional in her early 30s, wants to start investing more money for retirement. She starts by researching IRAs online and finds a company she thinks fits her needs. She fills out a contact form on the website and receives a follow-up email from the corporate marketing team. Brooke gets paired with a local financial advisor, who reaches out to her via a phone call to discuss some of her goals and a variety of investment options. After the phone call, the financial advisor accesses a number of preset journeys created by the corporate marketing team. He can then choose and personalize the right journey for Brooke. Brooke receives a highly personalized, on-brand message and instantly knows it is from the financial advisor she spoke with. The messages are professional yet personal. This instills trust with her advisor and leads Brooke to open a 529 College Savings Account with the company. Brooke gets a consistent, personalized experience from the brand. And the advisor gets the support of his company’s marketing efforts to help him drive revenue from his entire book of business. Unfortunately, many brands are missing the mark on delivering a seamless experience in distributed organizations. It’s really important to understand that, historically, distributed organizations only focused on recruiting and enabling agents, franchise owners, members, partners, and so forth, to sell on the brand’s behalf. Then they let the channel go and operate using their own tools, creating their own content, and using their own resources—typically this means the channel is operating in a silo. Today, companies are realizing that the customer experience is critical to business success. And these organizations need to figure out how that experience looks to their end customer; they need to determine how they can have control over that brand experience by delivering on-brand, relevant content for the consumer. Let’s take a look at use cases by vertical. While corporate marketing teams develop and approve on-brand communications, financial advisors, insurance agents, and brokers don’t always follow suit. These people on the front lines, who aren’t necessarily seasoned marketers themselves, can send digital communications that don’t align with corporate brand and messaging guidelines. Many owners, sellers, and consultants don’t understand the importance of how a consistent brand can enhance customer experiences. Others who understand may not have the tools, knowledge, or time to make it a priority. Create prebuilt journeys based on aggregate data and best practices. Establish consistency across a network of owners, sellers, and consultants. Channel marketers can build a solid customer journey strategy for their partner networks, but they also need to ensure channel sales partners are using the strategy as well. To amplify marketing reach, channel marketers need to make it simple for partners to access content and campaigns to improve channel ROI. Generate leads by engaging with consumers throughout their journeys. Personalize messages without altering corporate identity. Have a single view of consumer data to understand a consumer’s needs. Now that we’ve broken down a few use cases, let’s learn more about how Distributed Marketing from Salesforce works across the Customer Success Platform.